Friends and neighbors: If you’ve passed by the fountain in the past few days, you may have noticed that a pair of the concrete bollards around the perimeter of the center island have been knocked down. This is the result of a Presidents Day accident that occurred during the heavy rains; a truck went up over the curb of the island and struck the two posts. The good news: the protective bollards did their job, and the fountain itself was unharmed. The bad news: It will likely take a few weeks to make the repairs. The city is on the case, however, and there are replacement bollards ready to be installed once staff can arrange for traffic control they will need to be in place to do the job. We will update you on the progress of the repairs. In the meantime, please drive with care around The Circle, especially in wet weather. 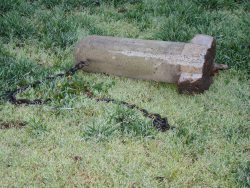 As you may or may not know (and you can learn by visiting our history section), the fountain you see today is a 21-year-old replica of the original fountain, which was erected in 1911 but destroyed when a truck went out of control coming down Marin Avenue in 1957 and smashed it to bits. We’d hate to see a replay of that terrible event. So please take it easy anytime you are rounding the fountain.